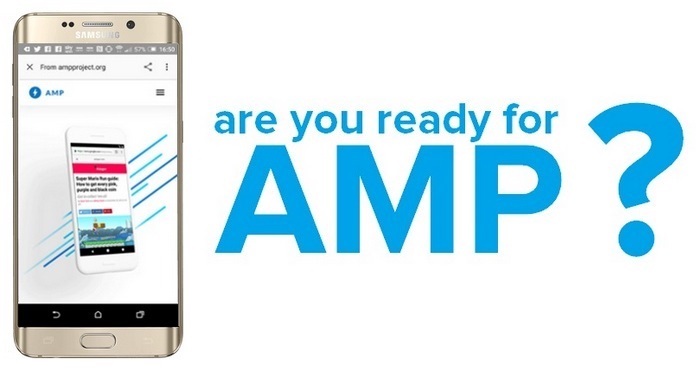 Are you ready for AMP - Accelerated Mobile Pages? In case you’re not aware, the internet is going mobile in a big way. Pinterest recently passed 200 million active users and reported that 85% of its searches were made via mobile. We are talking about a social app that has a really good desktop/laptop version. Yet mobile users are driving the site, and it has grown by a staggering 40% in the last year. It is clear why the internet is going mobile: two-thirds of the world’s population is now connected via mobile devices, and everyone is talking about Accelerated Mobile Pages (AMP). Accelerated Mobile Pages (AMP) is a project that Google is backing. The aim of it is to speed up the delivery of content through the use of stripped-down code known as AMP HTML. Accelerated Mobile Pages is a way to build web pages for static content (pages that don’t change based on user behavior). This method allows the pages to load (and pre-render in Google search) much faster than regular HTML does. AMP is your mobile site on a diet—lean, mean, and ready to perform. But there is quite a lot of controversy surrounding AMP. As Yoast SEO owner Joost de Valk points out, we are pretty much being forced to adopt Accelerated Mobile Pages. The speed at which your mobile site loads for visitors is becoming a big SEO ranking signal. And AMP caters to this necessity, making your site super fast compared to a regular mobile responsive site. Have you noticed how many AMP sites are ranking on the first page of your Google searches? It’s a lot! But AMP really does strip your site down to its bare bones. It takes away that desktop style that you worked so hard to achieve and exchanges it for speed. There are issues with running ads on AMP sites because the websites are stripped out. This is a problem for site owners and webmasters because we rely on the site income generated to pay for hosting and other site running costs. It is also very difficult with AMP to run the normal functionality you are used to on your desktop site. Again, most of it is stripped out in exchange for speed. The news about AMP is not all doom and gloom though. There are some very good WordPress plugins popping up to solve these problems. These plugins can turn your mobile site into a very good AMP website. Over at Infobunny, we tried a couple of the best plugins. First, we tried AMP by Automatic. Yoast recommends this plugin as the best to use and has created an additional plugin to help Automatic work better with its own. The Glue for Yoast SEO and AMP plugin by Yoast changes the default metadata that the Automatic plugin inserts. It makes it a much better Yoast and SEO friendly version. The issue we had with Automatic is that although it created a pretty good AMP version, we were unable to incorporate our Google Adsense ads. The second plugin that we tested was AMP for WP – Accelerated Mobile Pages. Again, like the first plugin, AMP for WP created a great AMP version of Infobunny. We were able to implement our Adsense ads into the site very easily. We were also able to change the design because the AMP version has the ability to upload logos within the plugin settings, among its other features. The problem we had this time was that we had some theme compatibility issues and were getting homepage navigation errors. Should you be looking to change your mobile site to an AMP version? Well yes, you should, whether you like it or not. Do you want your site to give the best user experience by loading fast? Do you want to send Google a big signal that you’re providing the best user experience? Then you will need to change or see your position on the search engine results page (SERP) dip. That being said, there is no great rush. Many big blog sites are sitting on the fence waiting to see where this situation goes and waiting for the switch to get easier. But one fact is certain: we will all need to have AMP versions sooner rather than later. Pretty much all the big news sites have already switched. But then, they have money and developers at hand to make the transition much easier for them than it would be otherwise. Have you switched to Accelerated Mobile Pages? Do you plan on switching? Do you think it is fair that we need to switch? Social Media Blogger and SMM - Owner of Infobunny.com and HowTo8App.com - Movie and Tv geek - Truth teller and life hacker. For me, a good question is if after implementing AMP to sites, we can see better ranking in google. I think some case study is necessary. We have now started implementing AMP’s on our applications. Thanks for sharing this with us! Everyone needs to adjust their applications to being mobile-friendly since as to what you said most of the people nowadays are now on mobile. Which route did you take to implement AMP to your site? Thanks for providing the AMP info. I’ve just started looking into how to implement this onto my WP site as I’m only a small affiliate gaining my traffic organically so need all the help I can get. I’m always looking at ways to improve visitor numbers and gain in google rankings. Thanks for providing some leads on where to head to next. Great, let me know how you get on with it and if you see a difference in your speed and hits. Thanks for sharing a very informative post…i aware abt AMP after read this article.content is too good.. I guess I’m yet to make my blog AMP compatible. I think most of the readers now a days are from mobile so its crucial to do that. Yes the Mobile UX is what counts. So you just have to be at least mobile responsive. Thanks Dexter for this sharing.I must say this is simply unquestionable . All the merits are well defined and I hope this feature will help a lot to rank higher on Google SERP. Hi Roger, yes but I do prefer how my responsive site looks over my Amp version. It is the style over speed trade-off. Off course….This is the most demanding thing actually, that Webmaster’s must have to implement AMP into their site’s…. BTW…..Thanks for sharing such a useful information on this trading Topic…….!! Thanks a lot for sharing this informatipon about AMP. AMP is trending and the best solutions to browse website or blogs over the smartphone. AMP will also play a little role in Google ranking. I also implement Google AMP on my website. Many thanks for your interesting article. Thanks for sharing. Google says more than 50% of searches globally happen on mobile. So, whether you’re onboard with Google AMP or not, one thing is certain: consumers want speed! There are plugins that will add them for you. Go to your plugin section in your WordPress Admin and search for them. I havn;t been able to add them using the automatic plugin. DEXTER ROONA would love you to read ..How do I boost my Pinterest engagement and visibility? Accelerated mobile pages will surely improve your website page traffic through mobile search. If you want a strong mobile traffic to your page then choosing AMP is the right move. Great article dextor had a wonderful reading session. Thanks, Robin, did you use a plugin for Amp? Or did you use another way to implement AMP into your site? Hanna would love you to read ..Hello world! It’s nice to see you here on Growmap. And you have done a great job here too. I have been up to AMP and the use of the AMP has helped me to increase my blog’s traffic. Thanks, Robin good to see you here. Yes AMP, I just wish it looked better that is the downside. AMP is a unique google algorithm. It’s a beautiful thing for AMP. because of the latest trends for mobile search.